Years and years on my heart to write, and over a year in the making, Nourished Beginnings is now available or purchase! Growing broad taste palates for nutrient dense real food really is possible! My three girls are living proof that serving simple, real food during those mold-able months and early years will reward you with toddlers and big kids that don’t bat an eye to a plate full of mineral rich vegetables, and brain boosting, nutrient dense food. Nourished Beginnings is my simple, no fuss approach to feeding babies a wide variety of vegetables, fruits, meats, fish, and fats – without spending all day in the kitchen. I will walk you through safe foods to start for baby’s developing digestive system, while nourishing their growing brains and bodies. Simple tastes of nutrient dense food as they explore the family flavors in the beginning will develop into full toddler meals that nourish rapidly growing bodies. 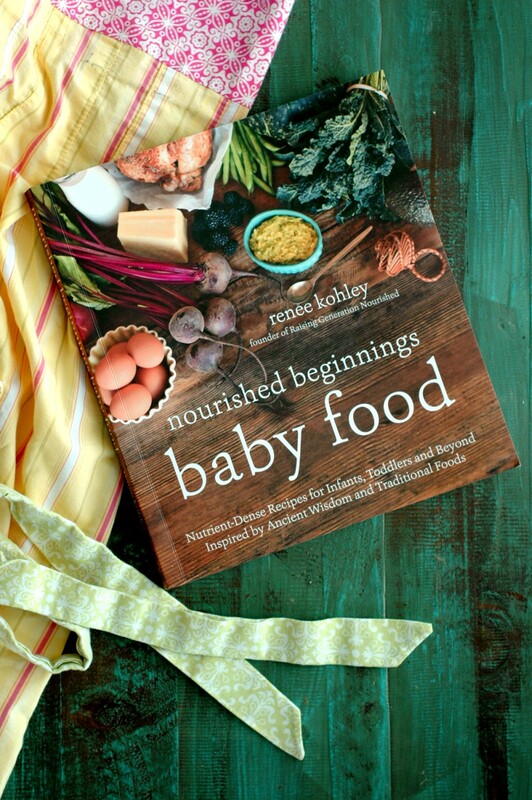 More than just a baby food book, this traditional foods focused cookbook will grow with your baby. These recipes are truly the heart of my home. They have been the center of my kitchen for the last 8 years…when I had my first baby. The Nourishing Pea Soup grows from babyhood to the school lunch thermoses. Baby’s First Smoothie grows into Tropical Green Smoothies they will thrive on as a teen. Nourishing baby with beef, chicken, and fish purees with nutrient dense add-ins will train their palates to enjoy a grassfed roast for Sunday dinner and fresh salmon fillets on a weeknight. Let me show you how to introduce brain boosting egg yolks, cod liver oil, and fish without fuss so that they will love and even crave them as big kids. My biggest goal is to show you how to make a nourishing meal for the whole family to enjoy – from the babies to the teens.